, the fashion classic, has been reprinted in a special 40th anniversary edition, with a foreword by Tim Gunn. I don’t remember where I first read this book; it must have been in the 1980s, and I’m pretty sure it was a public library copy, the cover reinforced with whatever the library grade of Con-Tact paper is. By that time I was already dressing much like the authors of the book, or as much like them as a high-school student in North Carolina could dress, so I read the entire thing as an exercise in confirmation bias. Of course I had olive drab army pants (several pair, including one I’d chopped off into shorts). I had multi-button wool sailors’ pants (too warm for the climate), men’s white t-shirts and oxfords, penny loafers, and (a significant find) a pair of incredibly beat-up (and uncomfortable) pair of boy’s cowboy boots, bought at a thrift store in Hickory, NC. I’d swiped my dad’s Levi’s jean jacket AND his Eisenhower jacket. I had good leather bags and belts (bought as seconds at the Coach outlet in town). I was certainly cheap; this book told me I was chic. Re-reading Cheap Chic is half nostalgia, half discomfort. It’s difficult to read this now without noticing what I didn’t notice back in the eighties: the constant underscoring of the idea that the base requirement for chic is a “lean body” (and the assumption that everyone reading the book could easily fit into boy’s-size clothing and would be comfortable going braless in leotards). The regular and slightly thoughtless appropriation of clothing from different cultures and classes (“ethnic” and “worker’s” clothing), including the advice that you should “Tune into Soul Train when you’re running low on ideas!” And of course, so much fur! It’s hard to read Cheap Chic without thinking about the assumptions behind what made things cheap or chic: things were cheap because they were either made cheaply (by people you didn’t think much about otherwise), were the surplus of the militarization of the twentieth century, or because you had the resources to invest up-front in something well-made and expensive that would last a long time (Saint Laurent boots are mentioned often). Things were chic because they made you look young, cosmopolitan, well-traveled, thin, and rich. I’d recommend reading Cheap Chic just to experience this discomfort, and to try to bring it forward into our lives now. What assumptions are we making today that will make our grandchildren cringe? When I saw that was available for review I stuck my hand straight up and said, “Me, please” and it just came a few days ago. 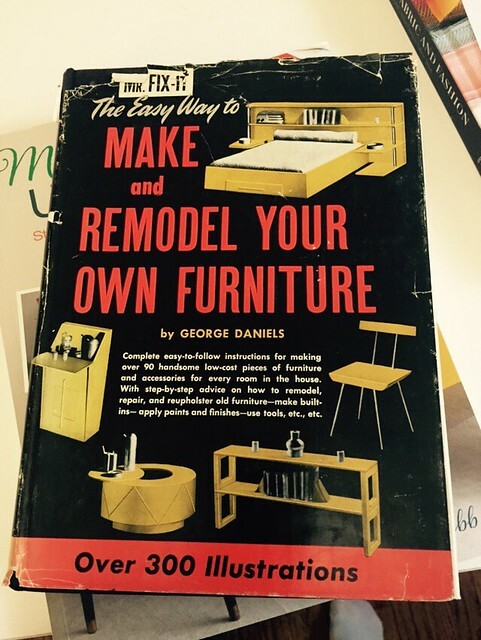 I have NOT yet re-upholstered anything according to these instructions, but I can tell it’s only a matter of time, because reupholstery projects involve three things I really enjoy: thrifting/yard-saling, choosing fabric, and hammers. I’ve only really ever upholstered a couple things in my life: a few chair seats (thank you, staple gun!) and a couple of futon covers (after the first of which I said NEVER AGAIN in a loud voice, but obviously I wasn’t listening to myself as I went on and did another one). *Note: do not try to sew futon covers in an un-air-conditioned room in the Chicago summer. But this book has really set me on fire to go prowling for an ottoman or two, or maybe even a settee. The pictures are lovely, the instructions seem clear upon reading (haven’t done any yet, of course …) and there are even time-lapse videos! but none of them have really gotten me to actually DO any upholstery. I think this book will be different. ANYWAY. I’ve been sent a lot of books, and haven’t had a lot of time. So I’m going to do a whirlwind tour of the bookpile! Hold on to your hats! There are only two dresses in this book, and there are really only dresses in my wardrobe, so the whole “wardrobe essentials” bit here isn’t very compelling for me, but one of the dresses is the that I’ve been wanting to make for ages, so that’s a plus. If you’ve every wanted to sew Burda patterns but were worried about the paucity of instructions, this book is for you. Just about every step is illustrated, and clearly, too. This looks like a great book for intermediate sewists or people who want to stretch a little bit … the patterns aren’t ‘easy’ but the illustrations mean you won’t go too far wrong. Who knows when I’ll make that dress, but I’ll probably keep this book around! is subtitled “20 charming patterns for boys & girls” and, well, it does what it says on the cover. If I were a hip and doting grandmother I would be making all these adorable tiny things in those really expensive Japanese cottons (but I’d only need a yard, so …). If you have suddenly acquired up to four winsome tykes and a rambling charming house and tons of free time (not sure how that goes with the tykes, but ¯_(ツ)_/¯) this is definitely the book for you! If you don’t have (or have and don’t sew for) kids this is totally worth picking up and flipping through for some nice design ideas, especially about yokes. is also a little light on the dresses (although there are several) but they’re really CUTE dresses. There’s also a whole section on patternmaking that I found easy to follow, with exactly the kind of changes I like to make: adding pockets, changing lengths, adding gathers or darts or pleats, and waistband changes. I’ll be coming back to this book eventually, because there are some nice patterns for knits, too. Another great thing about this book—models in a variety of sizes! is super-nerdy, and I love it. Not sure if I will make any of the projects, but the conceit is fantastic — basically there is TONS of craft inspiration in any library, and these projects are not just how-tos for the project, but how-tos for how to research for more projects! If you like math and/or quilting, you will like . is a beginner book, and I think that it is hard for someone who has been sewing a while to really judge the quality of instructions in beginners’ books, because we don’t remember what it’s like to have no context. That said, this one looked especially easy to me, but not so easy that the projects were boring or unrewarding. The capstone dress project is something you could imagine seeing on ModCloth, for instance, and the skirt has pockets. Also, the patterns are full-size — no photocopying or tracing up needed. is worth it just for the measuring tape brooch (page 38). I’m sure there are other books lurking in the bookpile … they’ll have to be dormant a little longer.